Remember when we said that you know where to find the GTX 780 Ti Benchmarks when they leaked? well here’s us keeping our word. Ladies and gentlemen, you saw it here first, the much anticipated GTX 780 Ti Benchmarks in all their glory. Update: These Benches were performed on Unofficial Drivers. Expect performance to increase with official drivers. The source of the leaks is the highly reliable Chinese forums Chiphell. 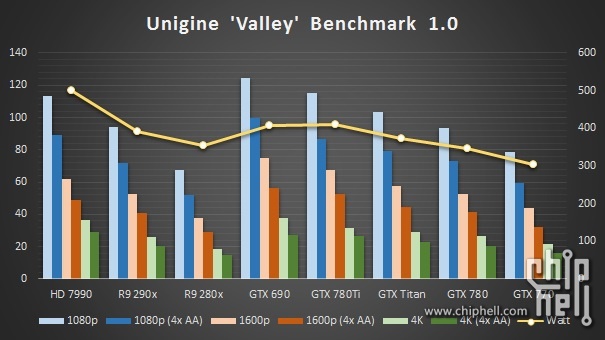 Without any further ado the Benchmarks of the the GTX 780 Ti vs the R9 290x and the high end spectrum of cards. 290X and the GTX Titan. resolutions including 4k. Dual GPU 690 is ahead of the 780 Ti. R9 290X it still leads the 4k chart with quite a margin. This particular benchmark is of Alien Vs Predator 3 and the GTX 780 Ti is leading once again (ignoring 690). However this time the R9 290X leads in the 4K department. equivalent to the R9 290X. So basically as expected the GTX 780 Ti dominates* its way to the top of the single GPU leader boards, did you notice the star? good. Sadly we saw an almost crippling effect of its low memory pool, its quite clear that at 4K resolution, where Nvidia’s New Titan took a slight beating, 3GB of memory just wont cut it. It is for this reason alone that we suggest that if you are indeed investing in a GTX 780 Ti, wait for the 6GB or the alleged 12GB version. Infact we would suggest you to ignore the 4k results altogather since the bottleneck is too great. It also makes us wonder what Nvidia is thinking with a 3GB 780 Ti. can bring these behemoths down to their knees its that one.